The Bicycle Kitchen runs a weekly WTF shift called Bicycle Bitchen from 6:30-9:30pm. 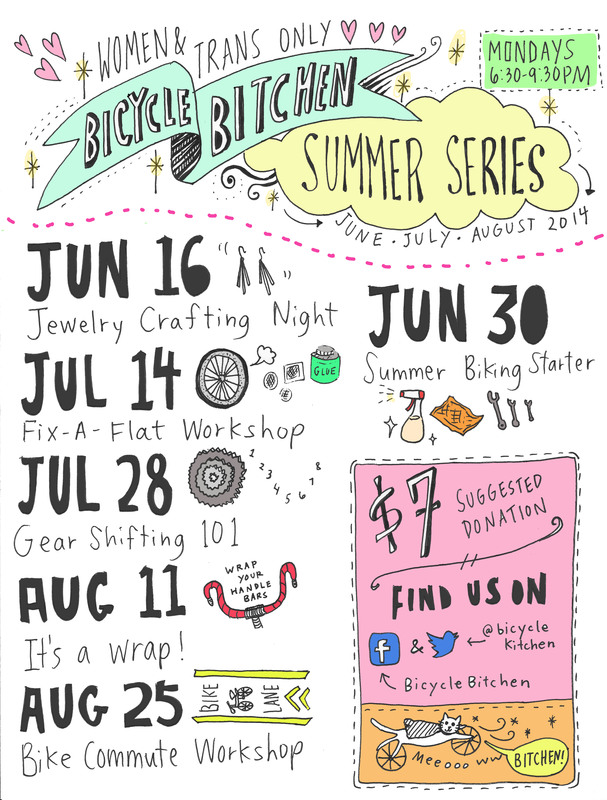 This summer they are debuting a series of workshops that cover mechanics, basics, cleaning, and other fun stuff like inner tube jewelry making and wrapping bar tape. I’m looking forward to being a part of teaching a few of these, but more excited for the fact that Bitchen actively creates its community by listening to what clients want and responding. It’s an amazing space where I always feel comfortable regardless of my knowledge of bikes and have met some amazing female-identified peoples that inspire me and keep me coming back. This entry was posted in How To and tagged bicicocina, Bicycle Kitchen, Bitchen, DIY, female, maintenance, mechanics, trans, women on June 23, 2014 by womenskit.